Winter Haven is home to 24-canal connected Chain of Lakes. This man-made Chain was created in the early history of Winter Haven to be able to transport the crop from the citrus groves easily to the railroad and other areas of the city. Today they make for one of the best playgrounds for fisherman and water-sports enthusiasts. 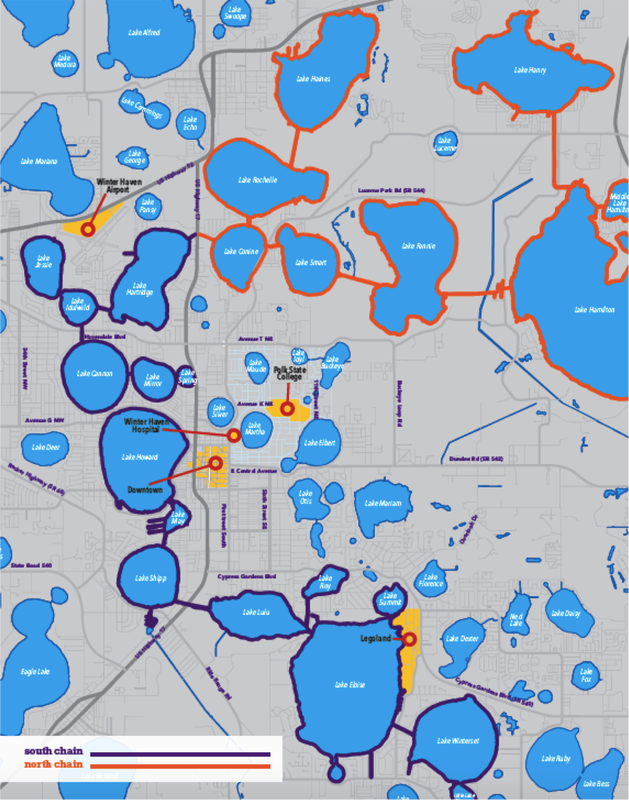 In addition to the Chain, Winter Haven is home to another 26 lakes and Polk County is home to a total of 554 lakes. Winter Haven is a place many people come to learn how to wakeboard, water ski and also enjoy all that our beautiful lakes have to offer. Check out this video, made by Visit Central Florida, to see why lakeside life is a vital part of our DNA. Winter Haven is also home to the world famous Cypress Gardens Water Ski Team. They perform periodically for free to the public on Lake Silver in downtown. To learn more about their month schedule of performances visit ​cypressgardenswaterskiteam.com. If you are interested in renting a boat or jet ski click here.